Distinguishing Characteristics Caucasian female. Brown hair, brown eyes. Gertrude did not use her married name, Silver, at the time of her disappearance. Some agencies refer to her as Gertrude Tompkins or Gertrude Tompkins Silver. Gertrude's father, Vreeland Tompkins, founded Smooth-On Inc. in New Jersey. She was raised as the youngest child in their family and had a stuttering problem when she was young. Her family sent her to live with a family on a farm in West Virginia during her adolescence. Her parents hoped that the new surroundings would help her overcome her social withdrawal and poor school performance. She attended horticultural school afterwards and raised goats for a period of time. She returned to work at Smooth-On Inc. with her father and lived in the New York City, New York area in the 1930s. Gertrude fell in love with an American aviator who was killed during World War II in the early 1940s. Her loved ones believed that she developed an interest in flying after his death. Gertrude took private flying lessons, then joined the Women's Airforce Service Pilots (WASPs) shortly thereafter. She reported to Avenger Field in Sweetwater, Texas, where famed female aviator Jacqueline Cochran began training women for flight with the United States' military's approval. The WASPs were trained to ferry aircrafts, test planes, instruct male pilots and tow targets for anti-aircraft artillery practices. They were employed from 1942 through 1944 during the war and referred to as "fly girls." Gertrude married Henry M. Silver in September 1944. The marriage came as a surprise to her family members, who believed that she may have felt sorry for him at the time. Henry's sister died after giving birth out of wedlock and he was preparing to adopt her child in 1944. He had known Gertrude for several years prior to their wedding and some believed that she was still mourning for the her lost aviator at the time of their marriage. Her father adored Henry and thought of him as a son. Gertrude returned to WASP duty two days after the wedding; she and Henry never saw each other again. She was not wearing her engagement or wedding rings when she departed for Texas, nor did she use her married name. Gertrude was scheduled to fly a P-51 Mustang fighter plane from Mines Field in Inglewood, California (now the Los Angeles International Airport, or "LA X") to Palm Springs, California on October 26, 1944. A photo of a similar aircraft is posted with this case summary. She planned to fly the plane to New Jersey during the following days, but WASPs were required to make stopovers at night to avoid flying during those hours. Gertrude taxied to one side of the runway prior to her departure to have her cockpit hatch repaired. She apparently departed from Mines Field at approximately 4:00 p.m. that day, but her flight records were lost and there is no recorded time for her takeoff. The tower and air traffic controllers had no copies of her flight plans for the day. She was not reported as missing until October 30, four days after her presumed disappearance. The military initiated an extensive search for Gertrude and her plane, but no evidence of a suspected crash was ever discovered. 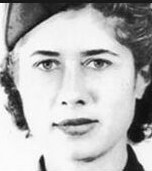 She was classified as "missing and presumed dead" in November 1944. Many of Gertrude's loved ones, however, believed that she may have staged her own disappearance to escape her marriage. Henry mourned his wife's assumed death until his own passing in 1965. There has never been any evidence uncovered to suggest that Gertrude survived after 1944. Gertrude's family members met airplane archaeologist G. Patric Macha in the 1990s. Macha believes that her aircraft crashed in the shallow water of Santa Monica Bay and is buried underneath layers of sand. Sonar imagery showed an object buried in the general vicinity in 2001. Searches of the area have not produced any evidence, however. Others believed that Gertrude may have crashed in the mountains near Palm Springs, a theory that Macha has never discounted. Gertrude's case remains unsolved. Updated 2 times since October 12, 2004. Last updated November 8, 2013; picture added and date of birth added.